This FAQ will be updated as questions are asked frequently. It's a play-by-post pathfinder game! It's effectively dungeons and dragons played via forum posts rather than sitting in someone's basement. Slowly but surely. There's no set time to play, people just check the forum when they can and post their character's actions, while I, as the gamemaster, post results of actions and the actions of all the non-player characters in the world. What is this Pathfinder you speak of? Pathfinder is an evolution of the 3rd edition dungeons and dragons rules. While many went to the new shiny fourth edition, the folks at paizo (who published a pair of monthly magazines for dungeons and dragons) decided they'd have more fun refining the existing 3.5 rules, creating a system that has nearly ten years of tweaks behind it for maximum fun. How do we do dice rolls? Finkswitch has pointed us at a dice roller utility, found in the resources topic, that lets you roll dice electronically and then link the results. We're also looking into a built in dice roller for drupal, if we can find one. As the game master, most of my rolls are hidden, so I'll be using actual dice. Alright, you have my attention. What do I do? First, you post your interest in the announcement topic. If there are lots of people, I will choose who gets to play (likely via dice rolling, natch.) Once chosen, you create a character using the pathfinder point-buy system and then we begin having adventures! How is this going to work, specifically? There will be two basic settings, exploration and combat. In exploration mode, you can pretty much post whenever, and I'll take care of arranging the actions myself. This will be the majority of the heavy role-play and exploration time, when the party is not being directly threatened. In combat, there will be a more strict order of events. Everyone will have an initiative score, and will be expected to act on their count. When your turn comes up, you will be the next to post, you'll declare your action and make your dice rolls, to which I'll respond with the outcome and the actions of any NPC's. I will be posting images of battlemaps with tokens representing the party and the bad guys so you can more easily visualize the battlefield, and make tactical decisions based on real information. Alright, that's it so far. Please post questions below, so I might answer them here! Hey I'm really excited about the game and had a few questions before I started digging through my books. 1: Are all books being supported? Anything I should be specifically stearing clear of? 2: Any classes specifically getting the axe? 3: Any races getting the axe? 4: Any particular feats/talents/spells being houseruled? 5: Any houserules in general worth mentioning? -The spiritual center of Sandpoint, providing shrines dedicated to the gods Abadar, Desna, Erastil, Gozreh, Sarenrae, and Shelyn. -The final resting place of Sandpoint's locals. -Sandpoint's highest quality inn, run by a Shoanti family related to the sheriff. -Cramped and chaotic looking library of maps and charts, run by an aged gnome. -Squat stone jewellery store run by a married dwarven couple and their hired guards. -Town dump, located at base of cliff. Gorvi's Boys gather waste from the town each morning and dump it off the cliffside here to be washed away. -Dilapidated shack home of Gorvi, fat and tattooed halforc who runs the town's waste disposal. -Cozy little home for the town's local intellectual. -Stone, dwarf-run shop that supplies quality locks to the entire town. -Stone fortress that doubles as both the militia barracks and jail. -Two story wooden building with a large meeting hall and many offices. -Stone weapon and armor shop, good place to find all sorts of combat equipment. -Old wooden family-run tavern, who's varisian grandmother offers fortune telling services. -Ruthlessly efficient tannery with a long history of high quality. -Stone smithy notable for it's difficult owner and his pack of red mastiffs. -Wooden shop for medicines, herbal remedies, and basic magical potions. -Cluttered wooden shop that offers alchemical and magical potions, with sometimes dubious results. -Tavern and showhouse with a small stage, popular among the patrons of the theater. -Stone building redesigned to serve as a dojo and repository of ancient Tian knowledge. -Stone glassworks factory, owned by the Kaijitsu family. -Family owned bakery, perfect place for fresh breads and pastries. -Wooden bookshop and library, with a number of chairs for casual reading. -Massive wooden playhouse with everything needed to put on impressive plays. -Local dwarf-run builder's union, now expanding their work to the local farms, compete for lumber with the Shipyard. -Primary lumber mill for woodcutters in the region, owned by the Scarnetti Family. -Two-story family owned general store, selling a little bit of everything. -Part school, part orphanage, part magical museum, operated by a retired adventuring wizard. -Ancient wooden manor, home of Sandpoint's oldest citizen, a varisian wise-woman. -Farmer's guild, providing crop storage, tools, and seed services. -Local clothing store that sells work from various town tailors and housewives, run by beautiful and unmarried half-elven woman. -Wheelwright shop owned by a paranoid, depressed man who recently lost his daughter to drowning. -Primary grain mill for region, only local mill to not have been destroyed by fire in recent months. Owned by the Scarnetti Family. -Popular dockside tavern, good place for seafood. Named after mascot hagfish and is a quality gambling hub. -Open-air market for purchasing spoils of local fisherman, operated by the Valdemar Family. -Open air marketplace, filled with vendors twice a week. -Slaughterhouse and butcher shop for both game and dometic meat. 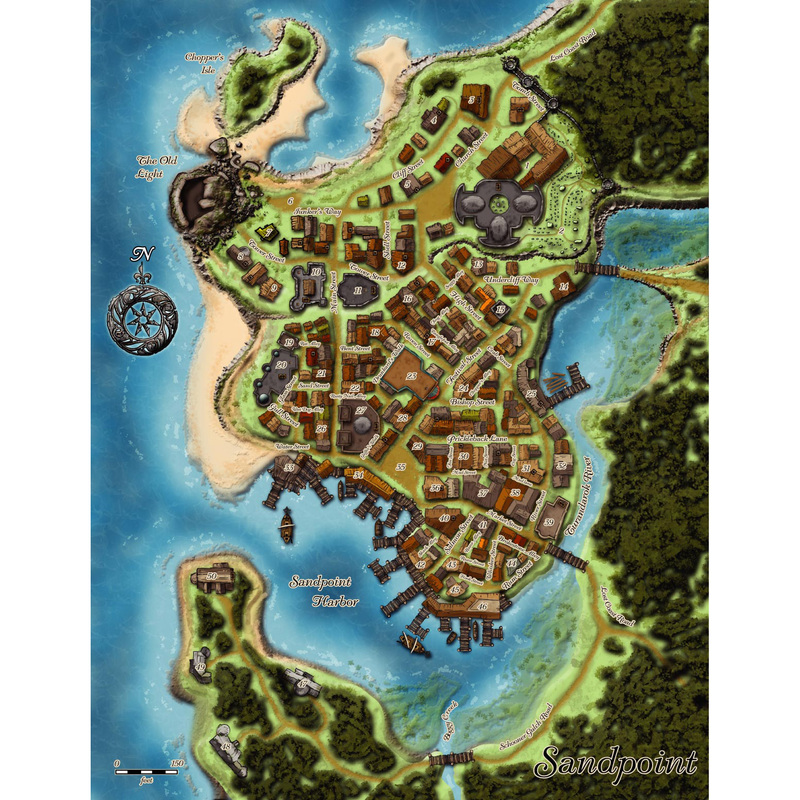 -Large inn and tavern known for being adventurer friendly, notable for its public Help Wanted board. Owned and operated by Ameiko Kaijitsu. -Stabling and mount services provided by a man with a near legendary hatred of goblins. -Primary brewery for sandpoint, supplying local brew to all the taverns in town. -General business center, managing caravans, mail, land ownership, and other affairs, run by a retired crusader, Sir Jasper Korvaski. -Wooden import shop, offering goods from regions all over the world, including clothing, weapons, toys and artwork. -Notorious bar known for bar fights and less-than-reputable patrons. Possible Scarzni crime family base of operations. -Local legal brothel, run by a principled madam and offering a variety of services. -Cramed and cluttered magic shop, offering many magical curiosities and possessing ties to collectors all over Varisia. -Local midwife and herbal doctor, also provides discreet birth control options to local men and women. -Large wooden shipyard, owned by the Valdemar family. Competes with the builder's union for quality lumber. -Home of the industrious Valdemar Family, founders of Sandpoint and operators of the shipbuilding and fishing industries. -Home of the conservative Scarnetti Family, founders of Sandpoint and operators of the Lumber and Milling industries. -Home of the tian Kaijitsu Family, founders of Sandpoint and operators of the Glassworking industry. -Home of the stately Deverin Family, founders of Sandpoint and the traditional leaders of Sandpoint. 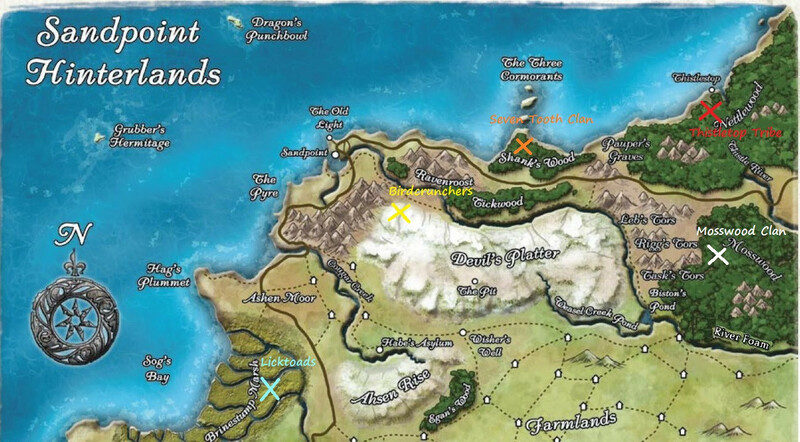 The map of the Hinterlands.